Home Blog Breed Info What Is The Lifespan Of A Border Collie? What Is The Lifespan Of A Border Collie? The unfair reality of owning a dog is that they have a much shorter lifespan than you’d like. The good news for Border Collie owners is that these dogs have relatively healthy genetics. Before discussing the Border Collie lifespan, let’s talk about how this pristine, seldom tinkered-with breed got here in the first place. Border Collie’s have a long history as versatile working dogs who nowadays make excellent family members. Their story goes back to first century B.C. It is thought that when the Roman empire invaded Britain they had dogs with them to herd livestock. Eventually, the empire disbanded and Vikings, who were also know to travel with dogs, cross-bred their smaller canines to create the more athletic Border Collie. This new breed would serve them well in the chilly highlands of The United Kingdom. They created somewhat of a super dog. They were originally appealing because of their unparalleled autonomy. With a capacity to learn commands and tasks within seconds, people did not have to monitor them for hours on end. These sheepdogs would handle livestock duties with little guidance and they had the ability to work long hours in unpleasant terrain. Rest assured, Border Collies have not lost their jobs. Farmers around the globe continue to employ these furry fellows to herd sheep and cattle around their grounds. They’re also considered top show dogs because of their strength, agility, intelligence, learnability, and balanced physical attributes. Most people don’t have rolling hills with cattle and sheep for Border Collies to spend their energy on. As a Border Collie owner, it is important to find other outlets for your pup to exhaust these furry little balls of energy. When Border Collies don’t receive proper mental and physical stimulation, it not only leads to destructive behavior it can lead to medical conditions that drastically shorten their lifespan. Daily vigorous exercise is necessary to keep this breed happy and healthy for years to come. There’s no dog breed that doesn’t come with their own particular set of medical issues. 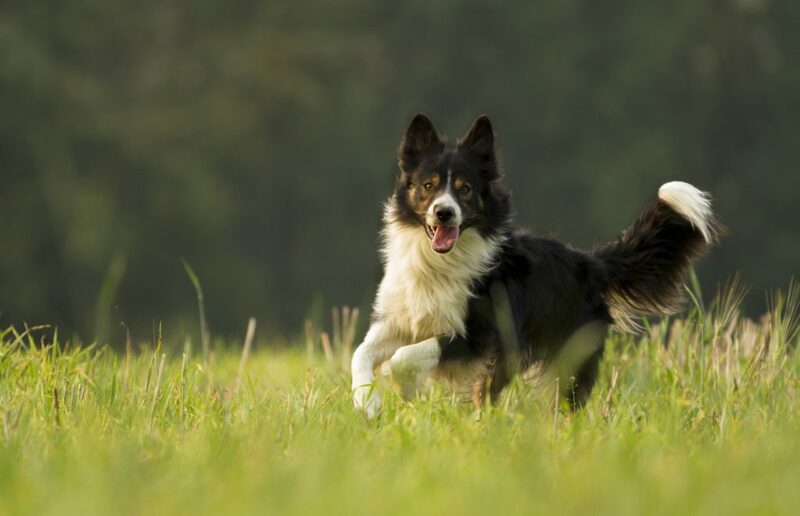 While the Border Collie definitely has certain problems they are prone to, overall they are considered a very vital breed who maintains their integrity well into their later years. Potential conditions include canine hip dysplasia, Collie eye anomaly, hypothyroidism, osteochondritis dissecans, lens luxation, canine idiopathic epilepsy, progressive retinal atrophy in dogs, and patent ductus arteriosus. Usually, when they do suffer from a debilitating condition it is tied to genetics, and can sometimes be detected early on by professionals. The average life expectancy of a Border Collie is 12 years. Their average overall range is between 10-14 but in some cases, they can live to be around 17. The leading cause of death is cancer at 23% and old age at 17%. As previously mentioned, many of the health concerns of a Border Collie stem from hereditary factors. A helpful way to determine their potential for health issues is by looking at their family medical history. Responsible breeders keep a thorough history and should be able to answer how long family members lived and what they died from. Try to avoid big brand supermarket pet food. It’s usually chalk full of additives and by-products that can lead to health problems down the road. Look for grub with high-quality protein and rich in omega fatty acids. Explore mixing whole foods into his kibble such as lean proteins, eggs, veggies, and fruits. Consult a professional and do some research before you make any dietary adjustments. Most likely your Border Collie is going to spend time outside, so don’t use chemicals on your lawn. Also, avoid household cleaners with harmful chemicals because Collies are curious fellas who will get their faces in every nook and cranny of the house. This can’t be stressed enough. Border Collies need exercise, exercise, and more exercise. Frustration and pent-up energy lead to depression and destructive behavior which can quickly lead to physiological problems. The vet can be expensive, but regular visits will keep your vet familiar with your dog. This increases your chances of identifying issues early on and will give you peace of mind that rover’s not hiding any secret medical ailments. No matter how long they’re part of your family, Border Collie’s provide joy, fierce loyalty, and companionship. There’s a lot you can do to give them the best quality of life possible, but above all never underestimate the power of love. Affection, engagement, and attention keep the mind stimulated and the heart happy!